At Kingsway Dental Centre, we welcome your entire family to our office, and that includes your small children. We begin seeing children at the age of three. Most three year olds have limited attention spans, so we will work quickly in order to keep them happy and help the appointment go smoothly. Early dental visits are as much about getting your child used to the dental office environment as actually performing a dental exam. 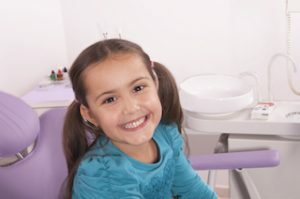 Our philosophy is that if we can get started early and create positive experiences around dentistry for your child, it will help them stay healthier for a lifetime. While three may seem early for a dental visit, it’s actually just the right time. Dental decay (caries) can develop at a young age. By monitoring your child and demonstrating how best to exercise excellent home care, we work toward preventing early childhood tooth decay. Your child’s first visit will be an appointment to help them become acquainted with the dental office. We will introduce your little one to our team and make them feel at home. We will give them a ride in the chair, count and brush their teeth, and do a polish for them if they let us. This first visit is also an opportunity for one of our dentists to do an exam and make sure everything is on track. In addition to excellent home care, regular preventative appointments are essential to maintain your child’s dental health. Dr. Jim Haymour will assess your child’s oral health and make any recommendations necessary to help keep your child from periodontal disease or dental decay. We will do a full exam, looking for signs of infection or any abnormalities. We also make sure that your child’s teeth are erupting at the right time and in the right location. At about the age of seven, we can evaluate your child for early childhood orthodontics. If we think they could benefit from early orthodontic intervention, we will recommend treatment. Preventative appointments also include a professional dental cleaning. By having your child’s teeth cleaned professionally, you are giving them the best chance at avoiding cavities and other dental conditions. When necessary, we take x-rays of your child’s teeth. When your child is young, not many x-rays are necessary because their mouths are so small. As they grow, we make sure to take an image of every tooth so we can look for decay and other common problems. We only take the images necessary for accurate diagnosis. Most children, at one time or another, need some type of dental treatment, usually in the form of filling a cavity or repairing a damaged tooth. Our commitment to keeping your child completely comfortable helps their treatment go more smoothly. Your child’s well-being is our number one priority. Call Kingsway Dental Centre to reserve an appointment for you and your children. We look forward to welcoming your entire family to our dental office.